1. Drink a lot of water! 2. Give your voice rest! Limit your speaking and singing as much as you can! 3. Do NOT use any candy or other stuff that has menthol in it! This candy may taste good and gives you the feeling that it helps your throat but it will increase the swelling of your vocal cords and the tissues around it! Because menthol dries out the tissues in your throat, these tissues will react by producing more swelling and mucus. Your voice will only deteriorate! 4. Do NOT eat and drink acidic foods and drinks. Acid will increase reflux from your stomach and will irritate the tissues in your throat. 5. 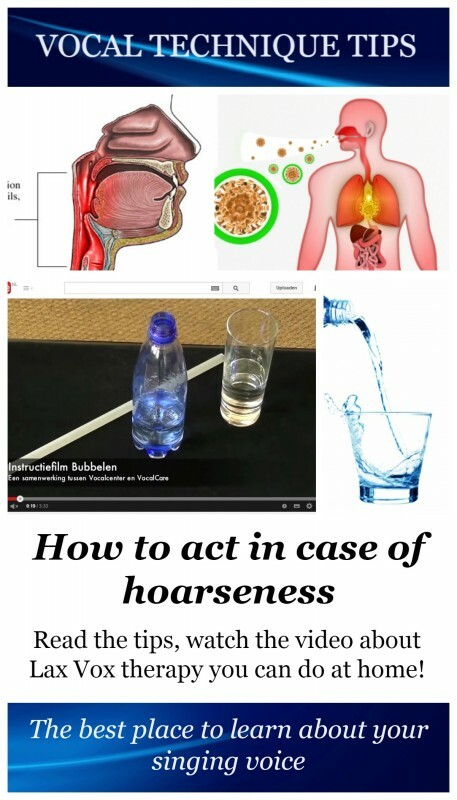 There is a method to decrease the swelling of your vocal folds: Put a straw in a bottle of water. Try to hum a song while blowing bubbles in the water with the straw. Hum gently, do not try to sing loud! Make sure you do this with your cheeks filled with air! With this exercise you create a downdraft of airpressure on to your vocal folds. This will work like a massage. After a minute or two you can allready hear the difference! The video shows you how to do it. 6. Do NOT scrape your throat. A good way to get rid of mucus is using the liptrill. 7. When your voice hasn’t healed after two or three weeks, you should see a doctor. Your vocal folds can be damaged. The article Vocal trauma; nodules and polyps tells you more about how to act in case of vocal problems.